Birdfinders seem to make a habit of creating new records on our tours and Israel 2006 was certainly no exception. Not only did we beat the one-week record for the number of species seen with an incredible 205 but we found a new species for Israel, Lesser Flamingo. In fact, the tour started in an amazing fashion because as we packed our luggage onto the coach on arrival at Ovda airport, we found a Black Bush-robin. This was not only the earliest ever recorded in Israel but also the first to be recorded in the Southern Negev outside the Arava valley and a foretaste of things to come. On the journey to Eilat we also noted our first couple of White-crowned Wheatears as well as Brown-necked Ravens. On day two we started by checking out the hotel grounds where White-breasted Kingfisher was a nice find. Yellow-vented Bulbuls were numerous throughout the tour and we acquainted ourselves with the first Rock Martins and 'Eastern' Common Redstarts. After breakfast, we headed to the ringing station where we found the White-tailed Lapwing that had been present for some time as well as our first Bluethroat, Graceful Prinias and Desert Finch. Next stop was at the Km 20 salt ponds and we were greeted by large numbers of common waders as well as Marsh Sandpiper and Greater Sand-plover. Water Pipits were present in good numbers as were several races of Western Yellow Wagtails including Blue-headed, Black-headed and supercillarius Black-headed. Other nice finds were single Woodchat Shrike and Citrine Wagtail and four Cretzschmar's Buntings. Desert Wheatears were quite scarce this year so we took the opportunity to seek out a fine male that had been present in the area for several days and also found Black-eared, Isabelline and Northern whilst doing so. At the end of the day we returned towards the North Beach and en-route saw a Peregrine (Barbary) Falcon perched on a telegraph pole. At the Date Palms we found Eurasian Wryneck, Arabian Babblers and Indian Silverbills before arriving at the North Beach where we tested our identification skills on separating Armenian, Lesser Black-backed (Baltic) and Caspian Gulls as well as finding a couple of easier-to-identify Pallas’s Gulls and good numbers of White-eyed Gulls. After an earlier brief view of a Western Reef-heron in the fish nets, just as it was getting dusk it flew over us heading inland to roost. On day three we started in the desert at km33 but sadly this place is a shadow of its former self. Nevertheless, with some hard work we tracked down Bar-tailed Lark as well as enjoying excellent views of several species of difficult warblers: Asian Desert, Cyprus, Eastern Bonelli's, Rüppell's, Sardinian and Subalpine Warblers. There was a heavy passage of swifts into the northerly wind whilst we were looking for larks and we were rewarded with amazing views of Alpine, Common and Pallid all keeping low to the ground. Heading northwards up the Arava Valley, we were pleased to find two good birds near Eliphaz: Cream-coloured Courser and Bimaculated Lark as well as Tawny Pipits and a couple more Bar-tailed Larks. We took lunch at the much-improved Yotvata (chocolate milk still excellent!) where a Common Myna sighting was probably the vanguard of this species invading into Eilat from the north. Common Myna is now a common, established feral breeder in Northern Israel. Birding around the kibbutz fields, Western Marsh-harrier, Hen Harrier and Common (Steppe) Buzzard patrolled the area whilst we checked through pipits and larks eventually finding a couple of Oriental Larks as well as good numbers of Red-throated Pipits amongst the Water Pipits and numerous Black-headed and Blue-headed Western Yellow Wagtails. We closed an excellent day at a Lichtenstein's Sandgrouse drinking pool and we were not disappointed with 18 of these magical birds giving excellent views. On day four we headed across the high Negev making many stops en-route. Highlights were many and included great looks at two Temminck's Larks, a couple of Desert Larks, numerous Greater Short-toed Larks, a Mourning Wheatear and good numbers of Trumpeter Finches. Egyptian Vulture, Eurasian Griffon, Lesser Spotted Eagle and Short-toed Snake-eagle soared over the Zin Valley as we looked for and found a wintering flock of Syrian Serins, and point-blank views of pairs of Scrub Warblers and Blackstarts were also much appreciated. Continuing deep into the Negev we suddenly noticed a change of scenery with agricultural fields taking the place of desert with flocks of White Storks and Black Kites everywhere. We finally reached our kibbutz for a late lunch but even then we were further delayed by terrific views of a pair of Syrian Woodpeckers! The lunch was excellent and, after a brief check-in, we headed back into the field as there were still plenty of birds to see. There were no lingering Saker Falcons around the Urim fields but we did find a Peregrine Falcon as well as good views of Hen and Pallid Harriers (both adult males), Long-legged Buzzard, Chukar and a nice roosting flock of Common Cranes. Our final destination of the day was a small marsh where we enjoyed good looks at Cetti's Warbler, Subalpine Warbler and unbelievable views of a pair of Little Crakes. Finally, after dinner at a local restaurant, we spent some time owling seeing several Barn Owls and a rather-elusive European Scops-owl before settling down into our comfortable Kibbutz guest rooms. Day five we took a packed breakfast with us into the Negev, en-route enjoying good views of several of the desert form of Little Owl. At our 'stakeout' it took us at least 10 seconds to find what we were looking for, a male Macqueen's Bustard. Although it was already quite close to start with, we were staggered to watch it approach us to within 40 metres giving not only excellent views but also great photographic opportunities of this enigmatic bird. A couple of stops at sewerage ponds drew blanks for drinking Spotted Sandgrouse although several small flocks of them flew overhead. We did find several Lesser Kestrels and Southern Grey Shrikes. However, returning to the agricultural areas produced results with about 30 of these cryptically-coloured sandgrouse, and a flock of no less than 12 Cream-coloured Coursers giving great flight and ground views before we started to make the return journey to Eilat. But with time on our hands we were able to make a diversion to look for Long-billed Pipits and we were rewarded with two displaying males and several singing Spectacled Warblers. The Negev had been good to us and now we headed south making just a couple of stops along the way. Day six was our day by the Dead Sea and we left immediately after breakfast. Our first stop was at a regular site for Lanner Falcon and we were not disappointed as one was sat on a pylon! Next stop was at some sewerage ponds where a male Hooded Wheatear put on a great performance and a male Namaqua Dove obliged with a flypast, so far so good. Continuing northwards, we enjoyed a couple of Steppe Eagles and a single Booted Eagle heading in the same direction before stopping for a break at a brand new McDonalds! Next, we checked out a site for Arabian Warbler and although it was pretty hot by then, a superb Arabian Warbler was found gathering nesting material and gave excellent views to all. On to Ein Gedi and before long we were watching Tristram's Starlings and Fan-tailed Ravens in the car park whilst some enjoyed a dip in the sea. This was the only spot on the tour where Northern Ravens were seen high against the cliffs, giving us all three resident ravens. Back to the southern end of the Dead Sea, we had brief views of Striolated Bunting en route. At the local fishponds we added several more good birds including Glossy Ibis, Clamorous Reed Warbler and Dead Sea Sparrow before entering a closed area with a local guide to look for Nubian Nightjar. One again, we were not disappointed as we enjoyed brief but good views of one bird before finding a second that obligingly sat on the track for about five minutes! We made our last stop of the day at a formerly good site for Hume's Owl. Despite the perfect weather (including lack of wind) we were not successful but everyone agreed that the experience of being in the silent desert under the stars was a memorable experience. Our last full day and we first headed up into the Eilat Mountains to look for Sinai Rosefinch. Driving up Wadi Shlomo we found two pairs of Sand Partridges, but there was little evidence of migration. At one of our usual sites, we were immediately successful in finding around 10 Sinai Rosefinches, although they were all females (males leave for their breeding areas earlier). Great views of Desert Lark and White-crowned Wheatear here as well. We headed back into town for lunch, but, beforehand, we spent an hour in central park finding a solitary Tree Pipit amongst the numerous Red-throated and Water Pipits and a single Ortolan Bunting with the Cretzschmar's. 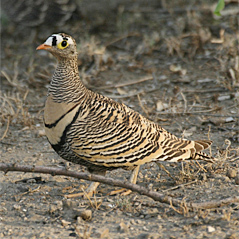 Oh, and did I mention the Common Quail walking around our feet! After lunch we headed back to km20 pools and whilst we were scanning through the gulls Sveta found a new bird for Israel, an adult Lesser Flamingo amongst the Greater Flamingo flock. Birdfinders had done it again! We added both Spotted Redshank and Little Gull as we drove around the pools to get better views of the Lesser Flamingo and by the time we were leaving the first two Israeli twitchers had arrived! Finally, we headed back to the North Beach where we saw all the familiar gulls again as well as three Striated Herons sitting out on the fish-farm nets. Our final morning and we tried for the Greater Hoopoe-lark again but unfortunately with no success. Heading back towards Eilat, we were astonished to see a Parasitic Jaeger (Arctic Skua) migrating low over the desert at k19. The same spot gave us several Desert Finches and the only Osprey of the whole tour. Right up the last hour we were still adding new birds to the tour list! We decided to spend the last half hour in Ofira park, which turned out to be a good choice as we found Eastern Orphean Warbler and an adult male Masked Shrike to bring our week's total up to a new record of 205 species. Birdfinders have been the only tour company offering tours to Israel over the past few years and its leaders have an unrivalled knowledge of the country and its birds. James Smith, Birdfinders’ staff leader, has spent 16 years birding in the country, and 11 years of leading tours there. He is a member of the Israeli Rare Birds and Distribution Committee, has unsurpassed knowledge of the birds of Israel and is a co-author of the two-volume set The Birding Hotspots of Israel. For anyone interested in birds of the Western Palearctic, or in witnessing the spectacle of mass bird migration, Israel is an absolute must.